The Award-Winning Breathable Baby Breathable Bumper reduces the risk of suffocation, entanglement and climbing. With the increased awareness of crib safety, the Breathable Bumper is an exclusive fabric with A.C.T. Air Channel Technology that promotes air-flow and helps maintain air access. This product has been Pediatrician evaluated and recommended. 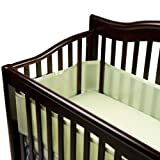 Soft and padded, keeps little limbs safely inside the crib. Hypoallergenic. Machine washable and fast drying.